Currently funding on Kickstarter, “It’s a Month!” is a very large tear-off 2015 calendar by Brooklyn-based graphic design genius, Dave Dawson, of design studio Cottleston Pie. With its enormous size of 36″ x 48″, the calendar basically trumpets each and every month in an equally chunky, elegant type. There’s also a small date calendar in the upper right corner of every page, just in case you need to know what the actual date is. Speaking on the design of the calendar, Dawson said he settled on using a framed layout and used Forza as the font type for the months and Gotham for the dates — both from Hoefler & Co. The huge type bleeding off of the frame area is designed to show off the character of the typeface. Dawson’s been working with a good printer to make sure that the project will be printed the way it’s been designed. The pages of the calendar will be printed through an offset printer and then bound with high tact glue on top. To make it easier to hang on a wall, three holes will be drilled through the calendar pages. Close up shot of the May page. 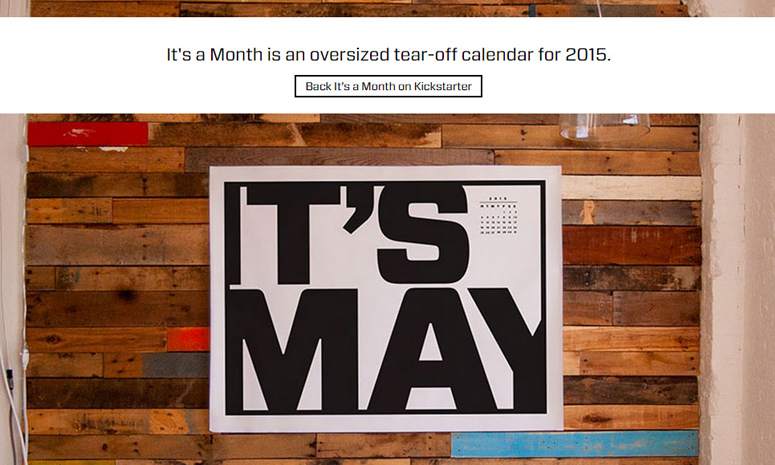 “It’s a Month!” is a breather from most tear-off wall calendars featuring artsy paintings, dreamy photographs, Word of the Day, or even inspirational quotes from notable people, so help to meet the Kickstarter goal and put the project into production. If you’re interested in wholesale orders, email the artist at dave@iamdavedawson.com.